Recently I got back on a motorbike. Despite not riding for a few decades, I was leathered-up and down the road about fifteen minutes after my new bike rolled off the truck. It was relatively easy getting back on. Some things you just never forget. It was a bit like….well…..riding a bike. Everyone wobbles at the beginning – the 50-year-old version of me is not the same as that girl of 20 who taught herself to ride on a compact 100cc, before moving up to a lightweight Kawasaki 250cc. 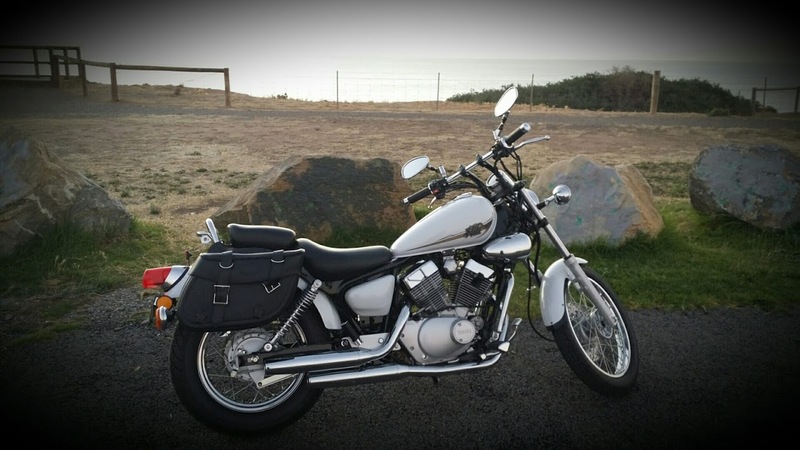 My new 250cc Yamaha V-Star cruiser is a bit heavier than the bikes of my past; and so am I. The current version of me has the muscle strength, eyesight and reaction time of an overweight, middle-aged woman who has birthed four babies. So of course there has been some wobbling. It’s not pretty, but its part of the learning (or re-learning) process. I plan on taking things easy, not be in a rush, and take the bends with care; until I’m more capable and confident. Be prepared and gear-up – unlike the younger me who had not yet realised that I was mortal, I have learnt the importance of being prepared. That’s not to say that I can’t be spontaneous, it just means that I need to be a bit more cautious. Investing in the right gear, and making sure I use it, is essential. Thinking before I act is also a good idea. No one is immortal. It doesn’t matter what others think of you – when I’m riding, I feel strong, happy and free. That’s probably not how other people see me. I’ve noticed the odd sour-faced look from women of my age. And I don’t care. Let them think what they will. I’ve found just enough courage to put aside restricting notions of body-image, femininity and ageing, and doing something that makes me feel alive. My life – my choice. It’s not all laughing behind my back, though. In the first week of getting the bike, I got up the nerve to take the highway to the next town. With the road all to myself, I opened up the throttle to 80kms/hour for the first time. Wind in my face, I remembered why I love riding. Then I saw a biker approaching on a Harley. He gave me the nod. He knew what I was feeling. I smiled to myself, and nodded back. Keep Your Mouth Shut – like bugs between the teeth, some words leave a bad taste. Its fun to ride with your visor up, but you risk a mouthful of insects. So its visor up and mouth shut. Much like life, really. It’s okay to be wide-eyed, see what’s happening around you, but it’s another matter to speak in a judgemental manner about what you think you’ve observed. I’ve noticed lately that the oddest statements sometimes come out of my mouth. I’m beginning to sound like a bitter old lady. I’m aware that its important to think first, judge less, and use the power of words well – I just need to work on that some more. Feel the fear: do it anyway – I’d be lying if I didn’t say that the idea of getting back on a bike didn’t scare me. After ordering it, I thought ‘what the hell was I thinking?’ Fear is good. It keeps us from doing dumb things, protects us from harm. Letting fear rule your life is not good though. It’s important to try new things. It’s good for personal growth. I’ve done a few new, and scary, things this year. I walked across the Cambodian border into Vietnam, alone, with barely any money in my pocket and no idea where I was headed. I went to a Rodriguez concert on my own. I went to Indonesia for the first time, travelling alone once again, to volunteer at the Ubud Writers Festival. I drove all the way to the centre of Australia, to see Uluru; sleeping in my car along the way. I approached some bookshops about stocking my novel. I attended a couple of corporate/networking Xmas functions alone, and forced myself to meet new people. And I bought a motorbike. All of these things were scary, especially for an introvert. These events, and others, all turned out to be enjoyable experiences. Don’t get too cocky – my life is on a bit of a roll at the moment. That’s not to say that I haven’t had challenges and bumps in the road this year. I used to be scared when things were going well; wondering when the rollercoaster would plummet again. It always did. However, now I have a bit more resources (financial and emotionally) to deal with whatever comes my way. I need to make sure I don’t get too cocky, though. I need to keep an eye out for hazards on the road. Even the smallest bump can be disastrous when riding a bike. When we get too cocky, mistakes happen. Enjoy every moment – last weekend, the odometer clicked over the first 100 kms. I was on a country road, travelling back to the coast after visiting a few nearby country towns. I watched open fields and rows of vines flash by, observing the occasional bird ahead of me. It was at about that moment that I had an epiphany. It was just me and the road, sans the protective metal coating of a car and distraction of a car radio. Instead of feeling insecure, I felt one with my environment, and really alive. Yeh, that’s cheesy. It’s a great feeling, though. I might still wobble in life, especially when learning new things, but I’m making the most of what time I have. I’ve learnt that you never know when your last moment is due. If I could only remember to keep my mouth shut, so I don’t get bugs between my teeth, then I’d be content with how life is progressing. And maybe I should stop procrastinating, so I can finish my second book. Another day, perhaps. For now, the open road is calling. Previous Post: What a Ridiculous Book! An image appeared in my mind as I was reading your post—decades ago, I saw a biker on a raked Triumph on a freeway in California’s central valley. He was in the slow lane doing about 60, and he was sitting back on his seat with no hands on the handlebars. No helmet. A scarf around his head. Sunglasses on. California’s central valley produces most of the fruit and vegetables for the United States, because of the climate, the farmers can grow crops year around—that is if there’s enough snow fall in the Sierra Nevada mountains. There are flying bugs in the central valley—lots of bugs. I wonder how he dealt with them. I also wonder if he survived. The seat on that raked Triumph was a long way from the handlebars and from what I witnessed he wasn’t paying much attention to anything but whatever he was smoking. On a different note, bugs aren’t that bad to eat. There’s even a company coming out with nutrition bars made out of cricket flour. I’ve yet to try one of the Exo bars. If Exo survive as a business, one day I will. Here’s what Exo says: Insects are exceptionally nutritious. They are high in protein and low in saturated fats and sugars. They are a complete protein, containing all the essential amino acids, and are also high in micronutrients such as iron, calcium and B-vitamins. Crickets, for example, contain substantially more iron than beef. Sounds gross, but I’m up for new experiences. Maybe I’ll try a plate of bugs when I next visit South-east Asia. Thanks for the encouraging words, Ms Very-Real Barbs 🙂 You too are an inspiration – for middle-aged women who dream of rediscovering love. Wishing you a wonderful festive season with the new man in your life.